Teachers for a Better Belize (TFABB) is a partnership of professional educators from North America and Belize. Since 1997 we have worked together as volunteers to improve preschool and primary (K-8) education in Belize’s Toledo district. 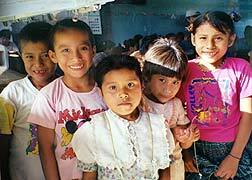 Toledo is the poorest and least developed region of Belize. Teachers there have little or no formal training in education; indeed, nearly a quarter of the teachers have no schooling beyond high school. They face onerous conditions, including limited supplies and multigrade classrooms (several grade levels taught by one teacher in one room). Over 50 percent of Toledo's teens do not go to high school, and thus have little chance of escaping poverty. TFABB's goal is to help equip Toledo's preschool and primary-school teachers and principals with the training, supplies, and facilities they need to help their students achieve educational, and ultimately economic, success. TFABB hopes its efforts will help break the cycle of poverty and dependency that plagues Toledo's villages by empowering teachers there to increase the number of children who finish elementary school, pass the national high school entrance exam, attend high school, and achieve long-term economic success. Inherent in our process of strengthening teaching abilities is a continuing dialogue with the educators and people of the region about how our efforts can best benefit Toledo's students. Kathie Dolan (a U.S. primary-school teacher) and Anne Frahn (an international development professional, with expertise in education issues) served as volunteer teachers in Belize’s Toledo region during 1996. At the suggestion of several Belizean educators, they co-founded TFABB in early 1997 along with Jennifer Johnson (a U.S. primary-school teacher), and began a long-standing partnership with Belizean Principal Carmelo Juarez of Big Falls village in Toledo to organize the annual teacher-training workshops. In 2000, Belize’s Permanent Secretary of Education visited the workshop and proclaimed it a model for the other five regions of Belize. In 2001, Toledo’s Regional Education Council and local Ministry of Education officials began working with TFABB’s U.S. board members to coordinate the workshop and to initiate related projects, and made the workshop mandatory for all primary-school teachers in the region. TFABB is the longest-standing nonprofit organization working to improve teaching abilities in Toledo, filling a crucial training need that the Belizean government cannot yet fully meet. In 2001-2008, nearly all of Toledo’s primary teachers attended the annual week-long TFABB workshop, more than a ten-fold increase since the first workshop in 1997 when 20 teachers attended. TFABB’s book and supply donations total well over $200,000. In 2003, TFABB expanded its efforts to include school-related construction, such as libraries. In 2005, we began to train Toledo’s principals in leadership and management skills. In 2007, we began training Toledo’s rapidly growing population of preschool teachers.